The music is driving, the people young and old, with painted faces swirling, laughing. The lights are low, and candles in front of an altar flickering. 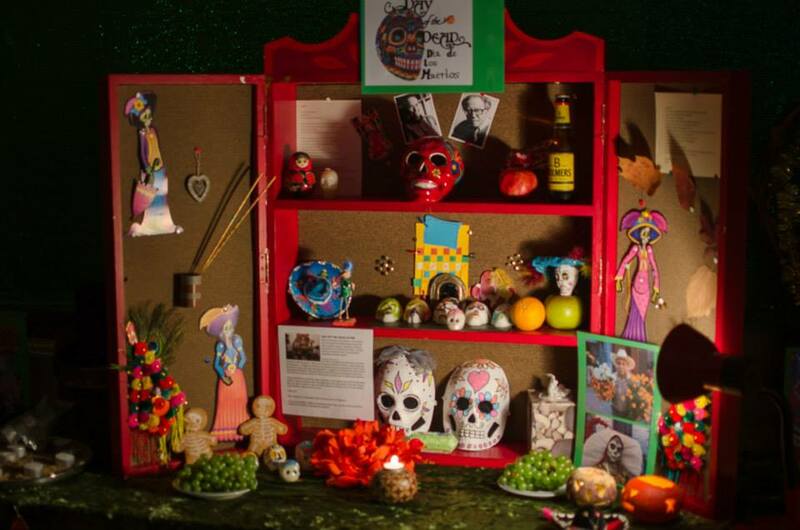 On the altar are photographs of departed loved ones, flowers, fruit, bottles of beer. This could be Mexico. But it’s Oxford: Wolvercote Village Hall, to be precise. 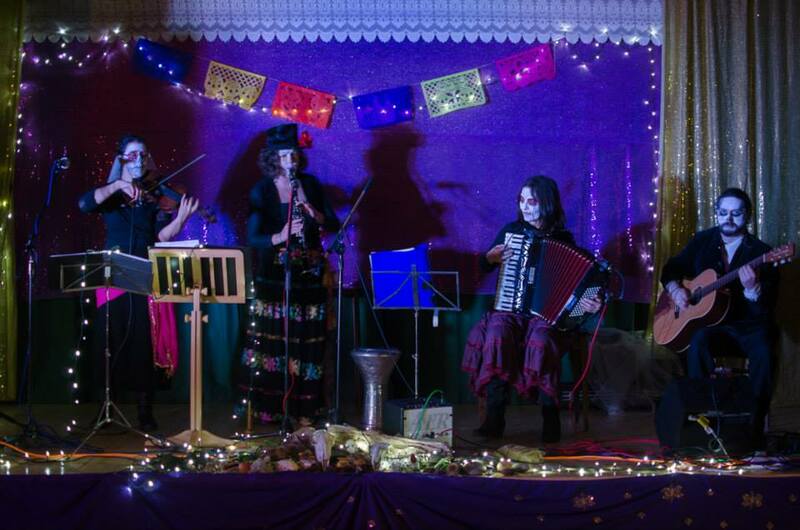 It’s the Day of the Dead Ceilidh. The Day of the Dead Ceilidh came about as a response to the request for a celebration in the middle of the Kicking the Bucket Festival. Liz Rothschild, Director of the Festival, asked if Kismet, the folk band I am part of, could create something special. I loved the idea that there should be dancing and music as part of a festival about death. As the poet Alice Walker has it, “Hard times require furious dancing.” So, of course, we said yes. There’s something very powerful about remembering the dead in the very heart of life. Taking inspiration from the Mexican Day of the Dead, we dress up, not as the spooks and ghouls of Hallowe’en, but as skeletons adorned with flowers and beautiful patterns. As we dance with each other, we dance with death, with life, with our loved ones lost. The altar is a cupboard that Liz found and painted red. On its shelves, we invite people to place photos of loved ones who have died, and to leave messages and light candles. 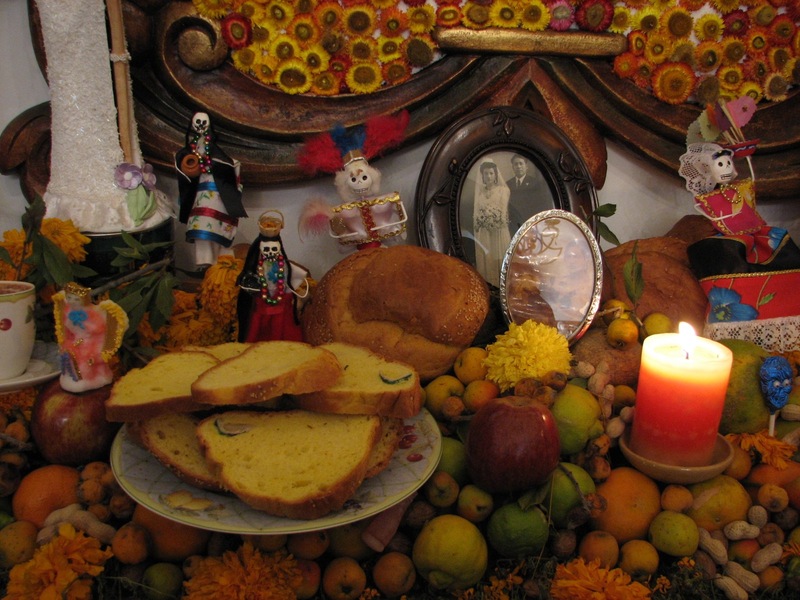 The Mexican tradition is to add objects associated with the people who have died, and to leave them their favourite food and drink. Our Mexican friend Noe kindly brought us back some Day of the Dead artefacts on his last trip there, so we have a few on our own altar. Kath Lucas, another member of Kismet, took two New Orleans Marching Band tunes and made them into a dance. The tradition in New Orleans is that the brass band plays solemn tunes on the way to the funeral, and breaks out into wild jazz for the party afterwards. In Kath’s dance, formal movements give way to fast and furious improvisations, and then back to the solemn with a new partner. From our vantage point on the stage, it’s wonderful to watch each couple playing with the contrasts. For the last dance, we turn the lights off and bring the candles into the centre of the circle. We switch of the PA and come with our instruments among the dancers. We play ‘Harsanik’ a slow, haunting Armenian tune, and the dancers step around and into the centre and bow, and out again. It is at once poignant and richly satisfying. The dance is traditionally done at the end of a wedding, where there is often sadness in the midst of joy. It belongs here too. One of the reasons I love the Kicking the Bucket Festival, and am proud to bring this event into the programme, is because looking death in the eye helps me not to take life for granted. My mother and father both died young, my father before he was 40 and my mother at 56. Who knows how many days, weeks or years we have left to live? Who knows how long our cherished friends and family will be with us? It’s so easy to lose perspective in the struggle of daily life and forget how blessed we are. 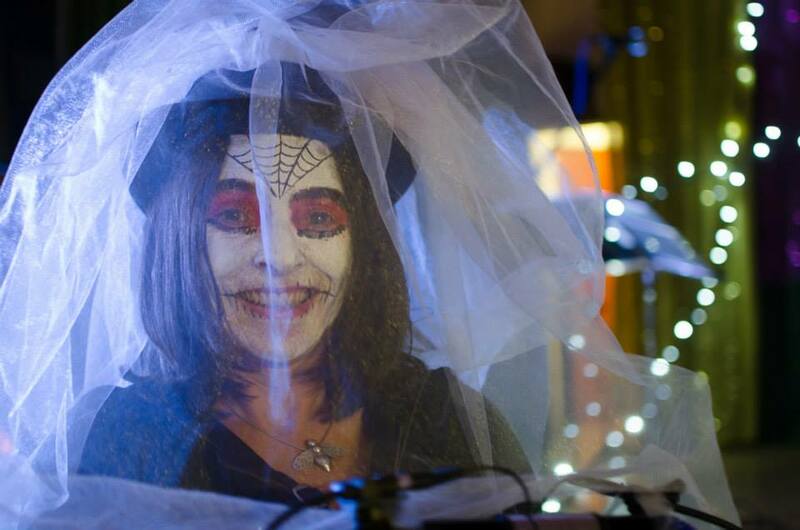 The Day of the Dead Ceilidh, and the whole Kicking the Bucket Festival, is a little reminder. There is also something wonderful – and unusual – about sharing grief. No-one wants to be the chief mourner at a funeral. It makes you untouchable. Here it’s no-one’s personal tragedy, but a collective act of remembrance. My grief, alongside yours, becomes more manageable. It’s easier to accept that death is universal, that everyone is living with loss, some recent and keen, some more distant and subterranean. Meeting the eyes of strangers in the dance, you know that they too have suffered. 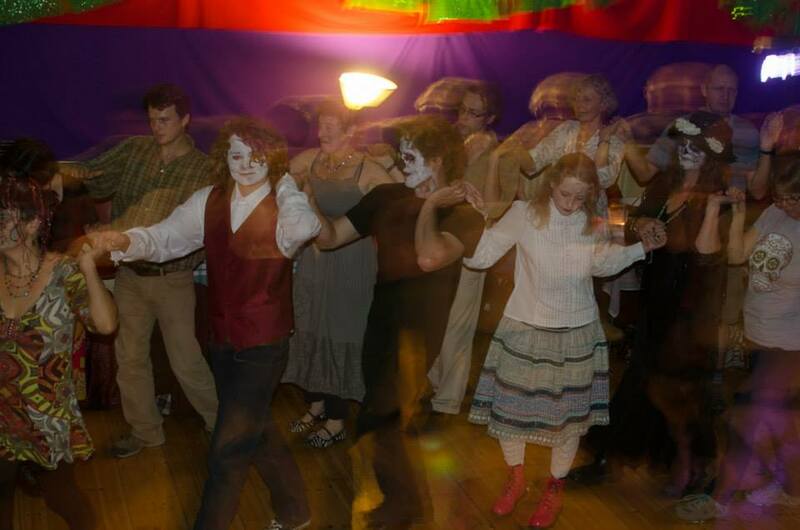 We held the Day of the Dead Ceilidh last year even when the Kicking the Bucket Festival didn’t run. After two years, it was beginning to become a tradition, to cut a groove in the cultural pattern of the year. Standing opposite to May morning, when we rise before dawn to rejoice in the coming of the Summer, it holds a place for honouring the darkness of Winter and the release of death. Humankind has been keeping the balance of these rituals for millennia. Why not come and join us this year? 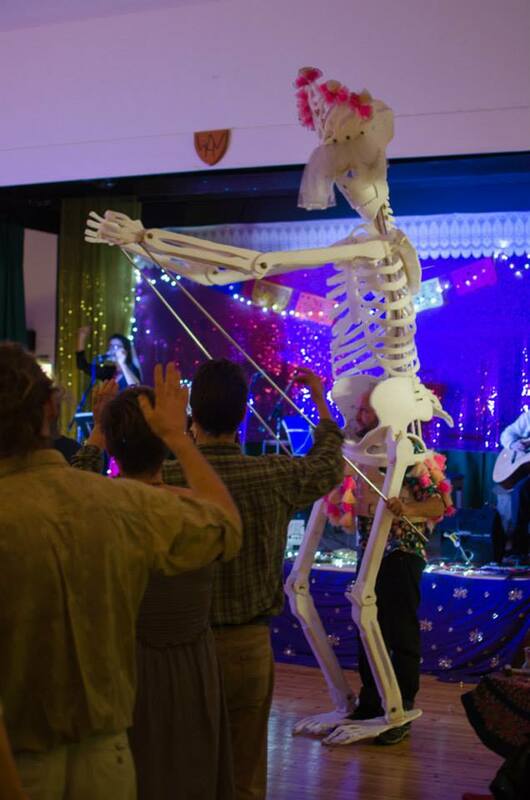 The Day of the Dead Ceilidh is at Wolvercote Village Hall on Friday 4th November. Doors open 7.30pm. Entry £12 / £10 conc.